Benton County was formed in 1905. It’s parent counties are Yakima and Klickitat. The book “Records of Yakima County, WA 1869-1907 and Benton County, WA 1905-1907 Death Records” contains the following quote which provides insight into early records for Benton County. “The Effect of the establishment of Benton County on the records of its past residents is important. Prior to Mar. 3 1905, records for most of its residents should be found in Yakima County with those for residents of about its southern one-quarter being in Klickitat County. However, the distance residents of the future Benton County had to travel to the courthouse at Yakima or Goldendale seems to have influenced what may appear in the records of either courthouse. It appears that residents of the Benton County area did not report as high a percentage of births or deaths as did those in other parts of Yakima County, this practice being carried on after formation of the county, only 38 births and no deaths being recorded between Mar. 3, 1905 and April, 1907. It also appears that some residents of the Benton County area secured marriage licenses elsewhere, especially those in the Kennewick area who were very close to the Franklin County Courthouse, at Pasco. 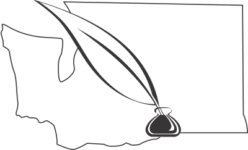 Newspaper and other sources also indicate that residents of the sourthern part of the Benton County area often went across the river into Oregon to be married rather than travel to Yakima or Goldendale for marriage licenses proir to Mar. 3, 1905”. In 1943 the Hanford Reservation was established in northern Benton County. This had a drastic effect on the history of the region. The population increased dramatically. But even more important to genealogy and family history is the fact that people came, worked for a short time and left the area. The Hanford Reservation was and still is a major employer in the area. As the work on the reservation changed (e.g., construction projects began and ended, and in the more recent past, shutdown of facilities such as N-Reactor and the Fast Flux Reactor) people came or left the area. You may well find your ancestor in this area for only a short time. A glimpse into the history of the area is provided in the introductory material in the 1964 Polk directory. While this description is of Richland you can imagine similar effects in the other towns and rural areas of Benton and Franklin counties. Benton County Historical Museum in Prosser provides a view pioneer history and cities in Benton County that became part of the Hanford Reservation. East Benton County Historical Museum in Kennewick provides information on the history of several towns in Benton County. Franklin County Historical Society and Museum in Pasco provides information on Franklin County.